Our capacity to interact effectively with others is not only a critical competency in all aspects of work and performance but also has a significant impact on our wellbeing and happiness. Daniel Goleman, a psychologist and science writer for the New York Times, popularised EQ through the publication of his first book on the subject in 1995. We now know that IQ & EQ are not opposing competencies but complementary and recent research has confirmed that most issues facing individuals and organisations are emotionally based. Building self awareness and EQ can dramatically increase personal and organisational performance. Emotional Intelligence (EQ) is the ability to sense, understand, and effectively apply the power and acumen of emotions as a source of energy, information, creativity, trust and connection. It’s the resilience to perform under pressure, the trust to build fruitful relationships, the courage to make decisions, and the vision to create the future. Essi Systems’ EQ Map was developed to help you assess, practice and master these skills. EQ Map is an extensively researched, norm-tested, and statistically reliable tool that measures emotional intelligence in an adult workplace population. Unlike a test, EQ Map is a multidimensional assessment that helps you discover the many facets that make up your personal emotional intelligence and its relationship to your performance, creativity and success. 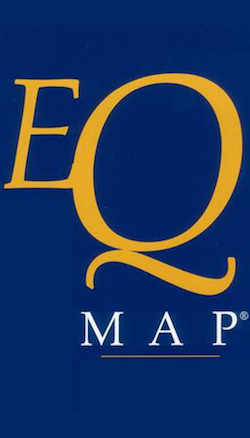 the EQ Map Interpretation Guide that provides details and recommendations for changing your performance. It is self-administered online, confidential, and easy to use and understand. Based on answers to 146 questions (which takes about 15 minutes to complete), the participant immediately receives their results. The best (in our opinion!) feature of the EQ programme is, however, the ability to use it to develop EQ competencies – so it’s not just about saying to our clients “this is where you are in EQ”, it also provides the methodology to systematically develop their skills, thinking and behaviours to improve their EQ by allowing them to retake the test any number of times over a 12 month period. The other advantage of this EQ instrument is that while it is an individual tool, it is very clearly linked to business imperatives, so as well as being an effective coaching tool for individuals, it can show organisations the benefit it can have to their bottom line. There is also the ability to have a Team Report. 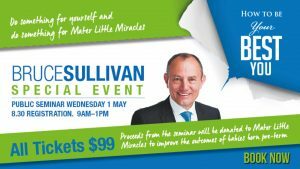 Please contact the office of Bruce Sullivan to discuss how we can help you or call on 1800 85 86 87.